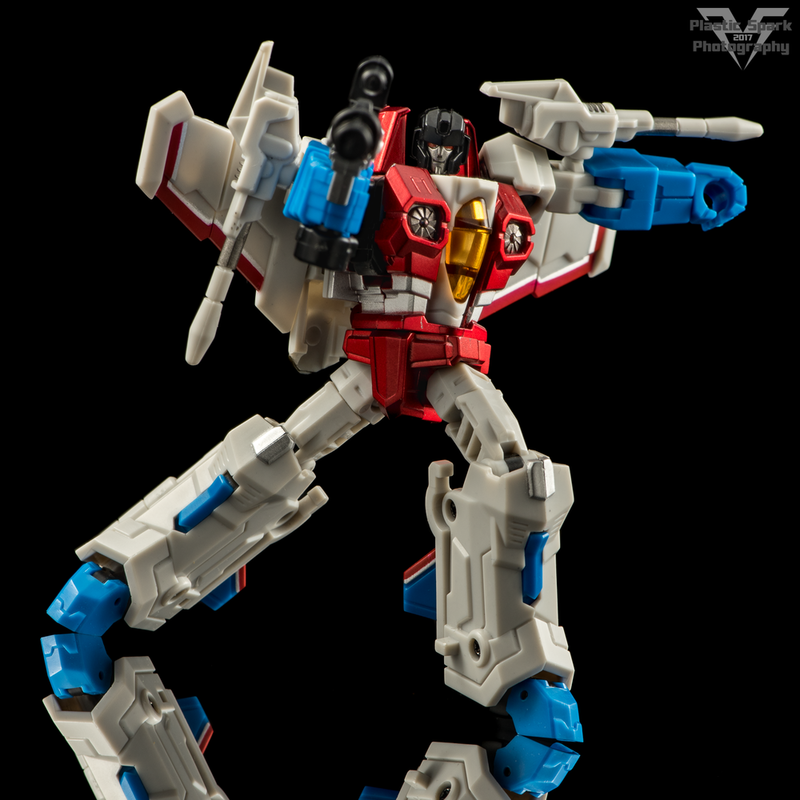 Iron Factory continues to dominate when it comes to third party legends scale transformable figures. 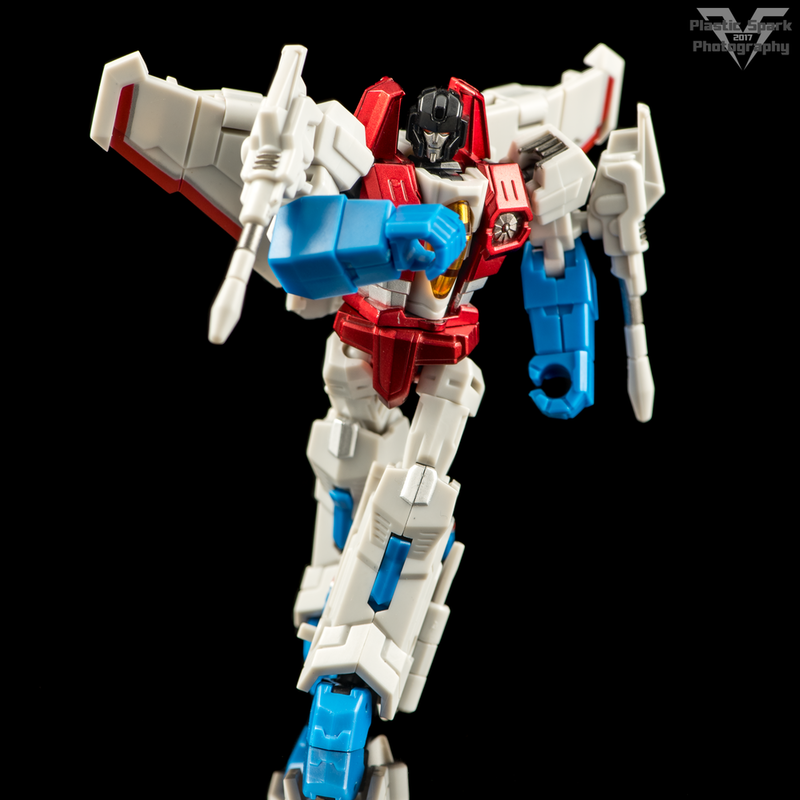 Wing of Tyrant – Red Version (Who I will attempt to refer to as Red from here on out) is a fantastic modern take on Starscream in a pocket size figure that you can take anywhere! Red’s vehicle mode is a fantastic recreation of the modern F-22 style Seeker. Due to his size there’s a bit more visible robot on the underside than I would like to see on a Seeker. His arms are just chilling out under the wings. This is forgivable given his scale but it would have been nice to see a bit more effort put in to hide the arms inside the body or something. 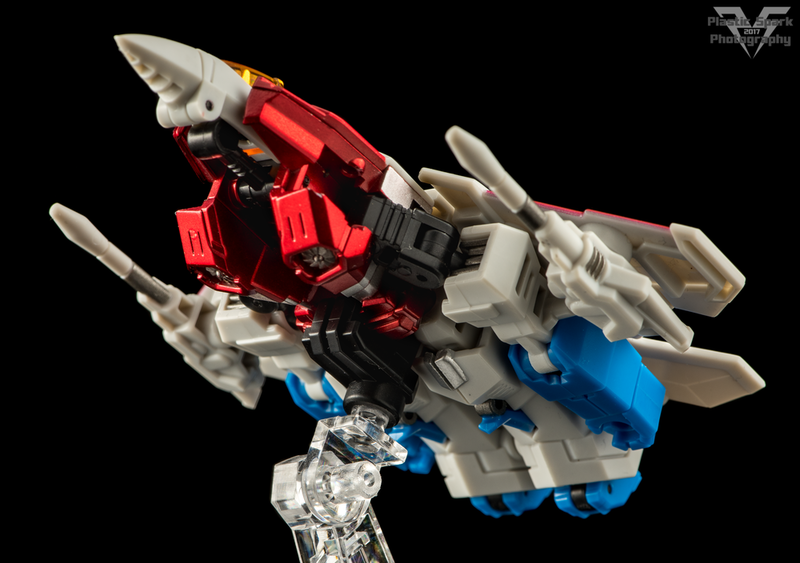 Red’s null ray blasters can peg into the bottom of the wings for attack mode, his vertical stabilizers can be adjusted to an angle of your liking, and he has flip out landing gear. There is even a clip on accessory to add a centralized 5mm port for use with the included flight stand. 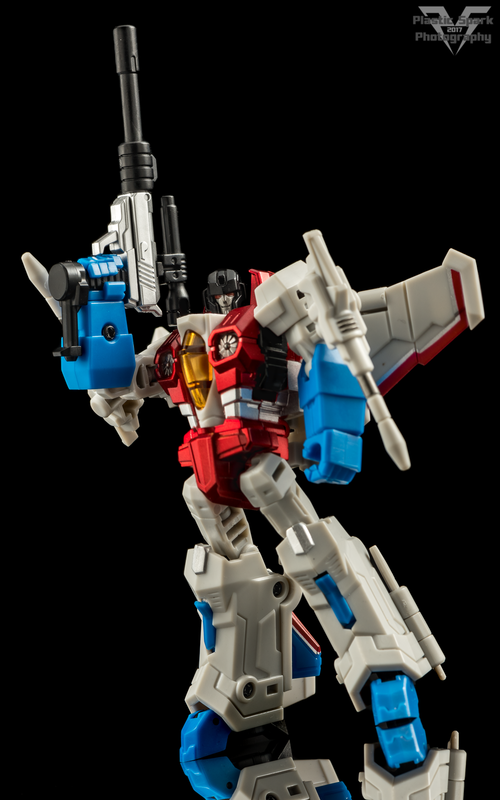 Iron Factory has ripped Starscream from the pages of IDW’s Till All Are One comic book and breathed 3D plastic life into him. This is an absolutely incredibly looking modern take on the classic character. 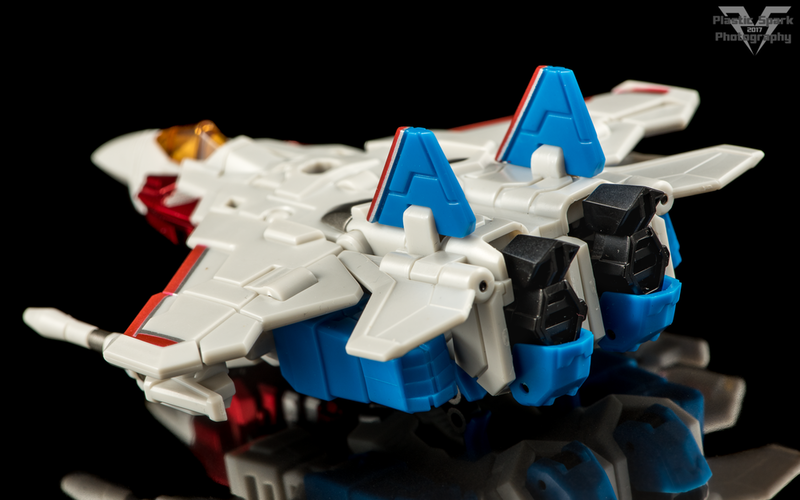 All the trademark features are represented from the upside down wings, to the tail fins on the sides of his feet, and his signature intake manifolds on the chest. All this with just the perfect sprinkling of modern design elements. 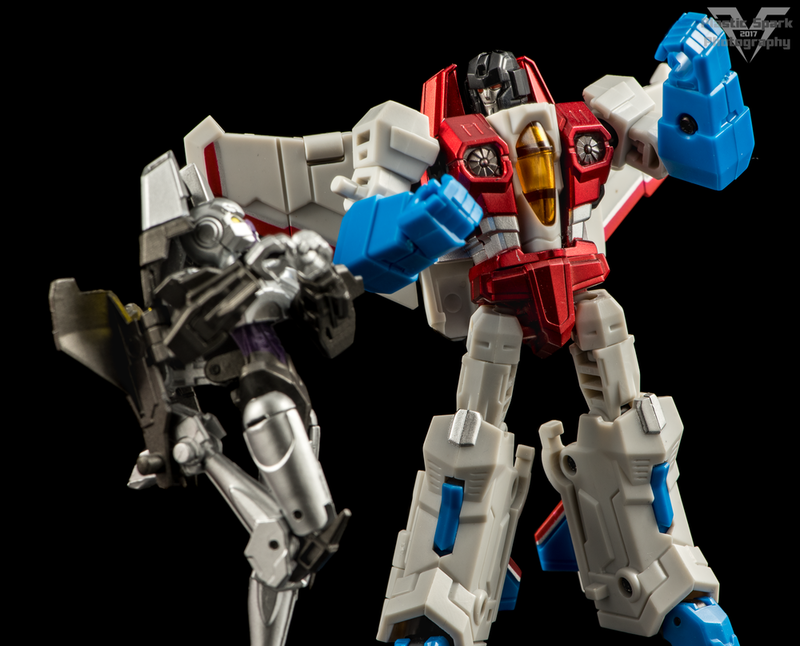 Rounded lines in the torso and lower legs, a fantastic, heroic, super robot posture, and a face sculpt that just oozes the greasy, grasping personality that is Starscream. The paint in most areas is truly exceptional. Red and white pinstripes on the wings and tail fins are applied clean and crisp. The eyes were unfortunately very poorly filled in but this is the only instance of poor paint I noticed. The torso and pelvis is painted in a metallic red with silver details that looks incredible but scratches very easily. Be very careful with these components if you want them to retain their metallic sheen. Articulation is fantastic as I’ve come to expect from Iron Factory. The head is on a ball joint, shoulders on ball joints as well as a sliding joint that moves up and down the torso for transformation, bicep, wrist, waist, and thigh swivels, single jointed knees that can utilize the transformation hinge for a sort of double joint, ankle tilt and toe/heel adjustment. It really doesn’t get much better at this size. Hell, many larger figures aren’t even this versatile! The wings are also on a ball joint so you can adjust them a bit to show emotion. 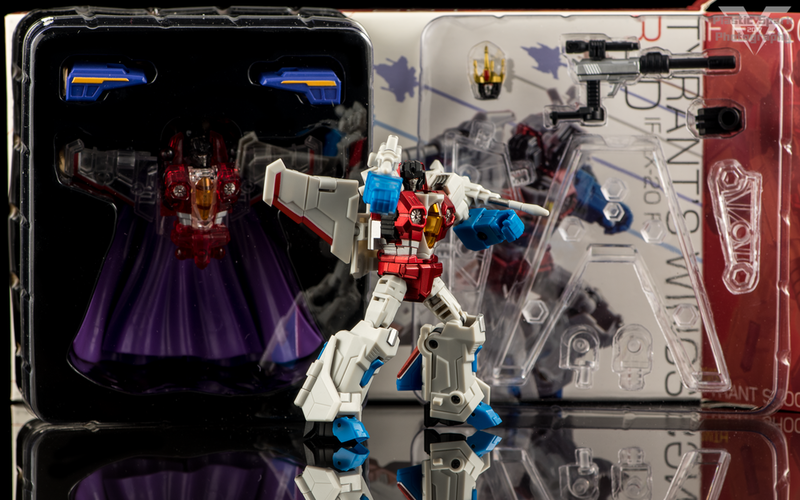 Null Rays – Starscream’s iconic bicep mounted firearm. Looks great, pretty much what you would expect. There’s just enough paint to make things interesting. Tyrant’s Pistol – Here’s where Iron Factory starts spoiling us. Red comes with an alt mode Megatron! Gorgeous silver paint, glossy black plastic for the add-ons. The support on the base of the grip is removable in order to peg into Red’s 5mm hands. I imagine you could use this for many of your classics figures as well. Coronation Gear – Brilliant purple shoulder armor with yellow detailing, replacement head with a painted gold and red crown (head pops on and off with a ball joint, easy swap) and a lovely hinged purple cape very similar in form and function to the one included with MP-11 Starscream. Taking the shoulder armor off is a terrifying experience but the look is absolutely undeniable and well worth the effort. 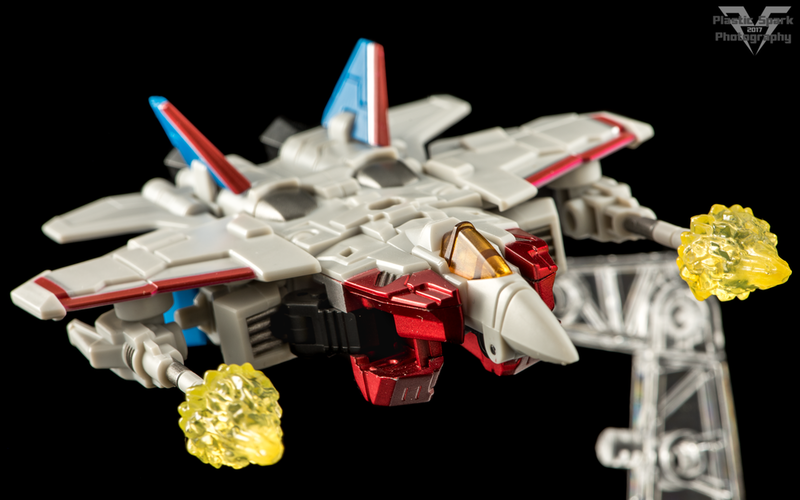 Ghost Starscream Components – Red comes with the translucent torso and head of Ghost Starscream. The clear candy effect is fantastic and really well done. All the panel lining in the wings really adds a nice effect. 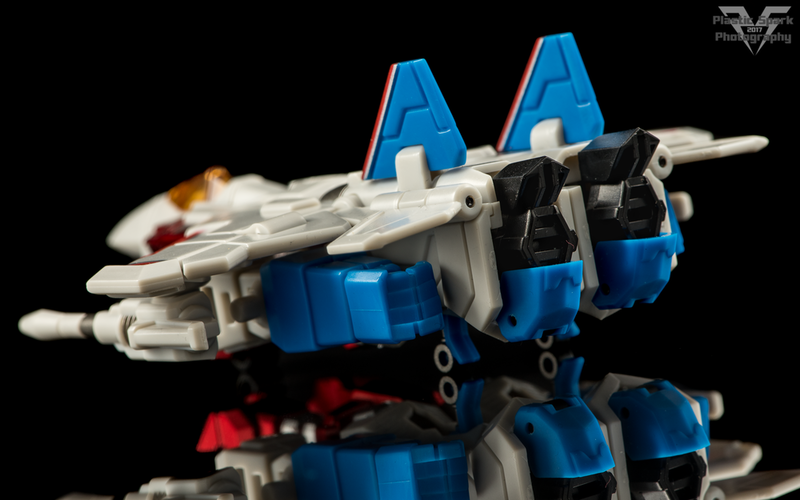 The remaining pieces will be likely be included with Wing of Tyrant Blue version and Purple version. Flight Stand – Another lovely flight stand identical in form and function to the ones that came with Pink Assassin and Shadow Assassin. Red also comes with a clip on black piece that attaches to the underside of his jet mode to form a centralized mounting point for the stand. Iron Factory continues to impress me with each release I get a chance to check out. This is an absolutely phenomenal legends scale Seeker mold with exceptional accessories and a ton of personality. The pricing may seem a little high but when you take into consideration that you are getting 1 ½ figures plus a ton of accessories for the asking price I feel that it’s a fair value proposition. 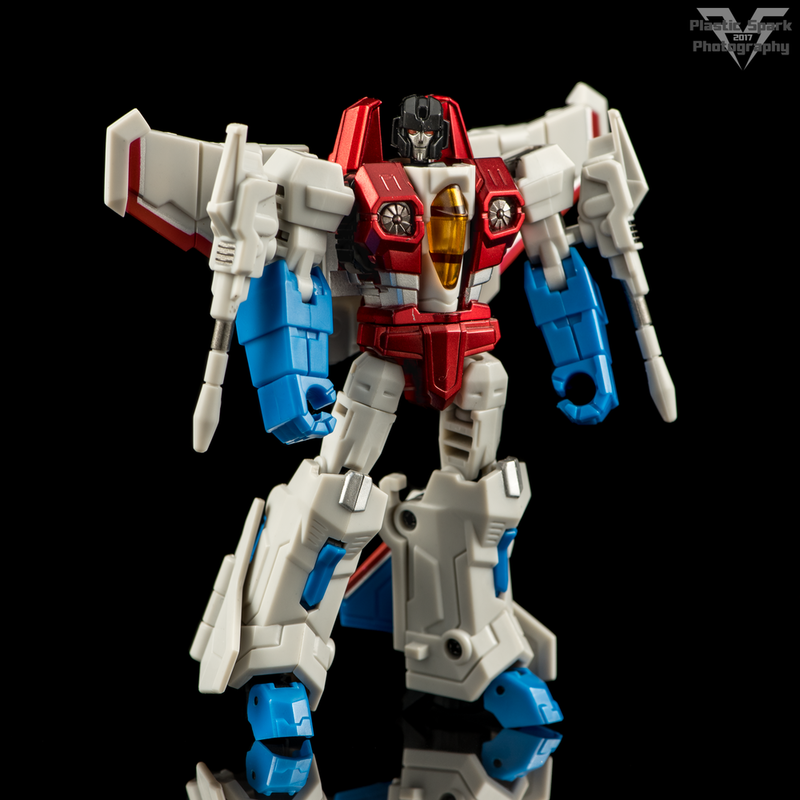 I know DX9 has some legends Seekers available as well in a more traditional G1 flavor. 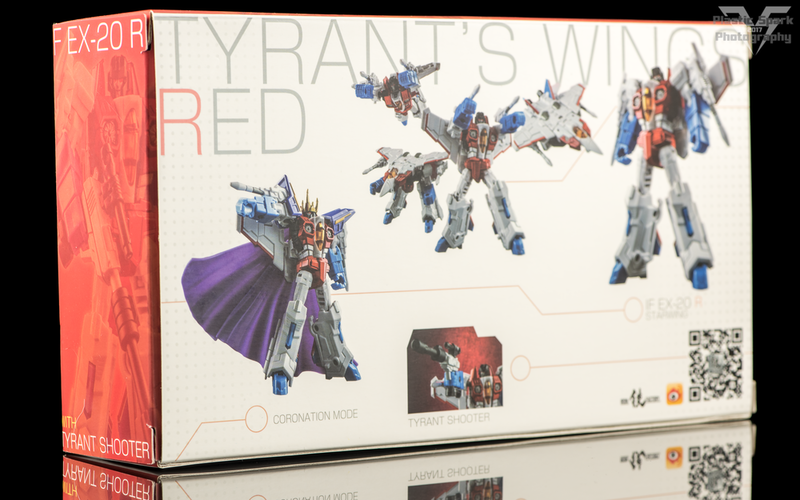 I haven’t had an opportunity to check them out so I really can’t tell you how this guy compares but I definitely give Iron Factory Wing of Tyrant –Red Version my full recommendation as the legends scaled, IDW styled Starscream for your collection. The only thing I found to complain about was the easily scratched metallic paint, everything else about this guy is absolutely top notch. Thanks for checking out the review, see ya next time!